When it comes to cooling things in the lab, scientists have long found an experimental lower limit just above the theoretical coldest temperature. Well, a group of American scientists have now made things (lowers shades) …even cooler. A team of scientists from the National Institute of Standards and Technology (NIST) working in Boulder, Colorado tweaked an experimental method to cool a piece of aluminum below the so-called “quantum backaction” limit—a temperature slightly above absolute zero that quantum mechanics has prevented us from crossing before, equal to one-fifth the magnitude of quantum motion, as reported by The Washington Post. That’s 10,000 times colder than the vacuum of space. Such cold temperatures could be useful for creating hyper-sensitive sensors, in addition to helping scientists explore quantum mechanic’s effects in larger materials. Quick physics recap: Temperature is the average kinetic energy of a collection of jiggling particles. When scientists say they’re making things colder, they just mean that they’re trying to slow all of the particles down. At absolute zero, -273.15 degrees Celsius or –459.67, degrees Fahrenheit, the particles stop completely. Usually, to get an object very cold, physicists shine light at it, causing its atoms to lose momentum. But the unpredictability presented by quantum mechanics leaves a little excess heat that scientists normally can’t get rid of—the quantum backaction limit, explained study author John Teufel, a physicist at the NIST. 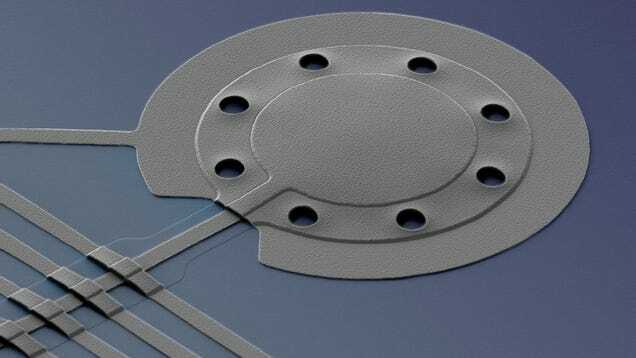 The experiment that has now circumvented this issue consisted of a tiny 20 micrometer by 100 nanometer drum, linked up to a circuit designed to cool things in the usual way. Microwaves bounce around inside the circuit, causing it to resonate and vibrate and generate its own photons. The photons depart and take a phonon, a quantum unit of vibration, with them, cooling the drum a tiny bit with each exiting photon. For this experiment, the scientists also shined a special kind of light— squeezed light—onto the drum’s head, sending the temperature below the quantum backaction limit. Quantum mechanics says that you can resolve some measurements of light at the expense of others. The squeezed light takes advantage of this property, allowing the scientists to remove one kind of fluctuation in the light’ s amplitude. They published their results in the journal Nature on Wednesday. “It’s the first time someone has used squeezed light to do better cooling,” Teufel said. Shining that squeezed light reduced the object’s temperature below the quantum backaction limit by a factor of two. “We’re not at absolute zero yet because our squeezing isn’t perfect,” he said. Cold stuff is useful for more than making ice cream. With tiny energies like those measured here, scientists can measure the effects of quantum mechanics in things larger than individual particles.